Most of us know what it feels like to fall under the spell of food -- when one slice of pizza turns into half a pie, or a handful of chips leads to an empty bag. But it's harder to understand why we can't seem to stop eating -- even when we know better. When we want so badly to say 'no,' why do we continue to reach for food? 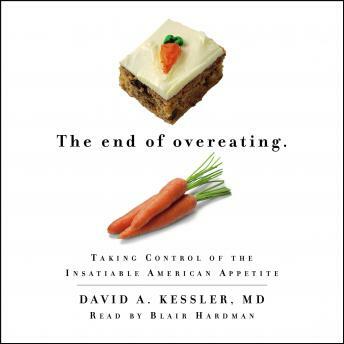 Dr. David Kessler, the dynamic former FDA commissioner who reinvented the food label and tackled the tobacco industry, cracks the code of overeating by explaining how our bodies and minds are changed when we consume foods that contain sugar, fat, and salt. Food manufacturers create products by manipulating these ingredients to stimulate our appetites, setting in motion a cycle of desire and consumption that ends with a nation of overeaters. The End of Overeating explains for the first time why it is exceptionally difficult to resist certain foods and why it's so easy to overindulge. Dr. Kessler presents groundbreaking research, along with what is sure to be a controversial view inside the industry that continues to feed a our nation -- from popular brand manufacturers to advertisers, chain restaurants, and fast food franchises. Dr. Kessler's cutting-edge investigation offers new insights and useful tools to help us find a solution. There has never been a more thorough, compelling, or in-depth analysis of why we eat the way we do.